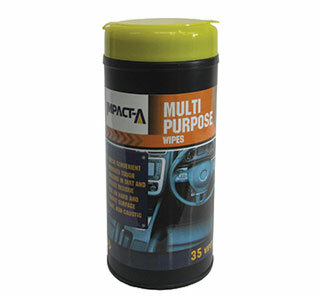 Impact-A Multi Purpose Wipes provide a quick and convenient cleaning solution to all manner of dirt and grime on both hard and fabric surfaces in your vehicles interior. Safe, non-caustic formulation to remove tough, ground-in dirt as well as sticky residue from upholstered, vinyl and leather seats, door trims, carpets, seatbelts, headrests and glass. May cause smearing on glass surfaces.